Confused about countertops? You should be. The three most popular types of kitchen counter materials—solid surface, quartz, and slab granite—look alike, at least at first glance. This is intentional. Amazingly stone-like looks are engineered into solid surface and quartz and are nature-made in slab granite. Only when you get close to the material and feel it do you begin to discern differences. Note that in the charts below, "homogeneous" is used to indicate a material in which elements are mixed to form a consistent, even look. What Is It? Solid-surface is the term for a type of heavy polymer-laden countertop material. Due to brand competition, it is a lower priced and popular material. 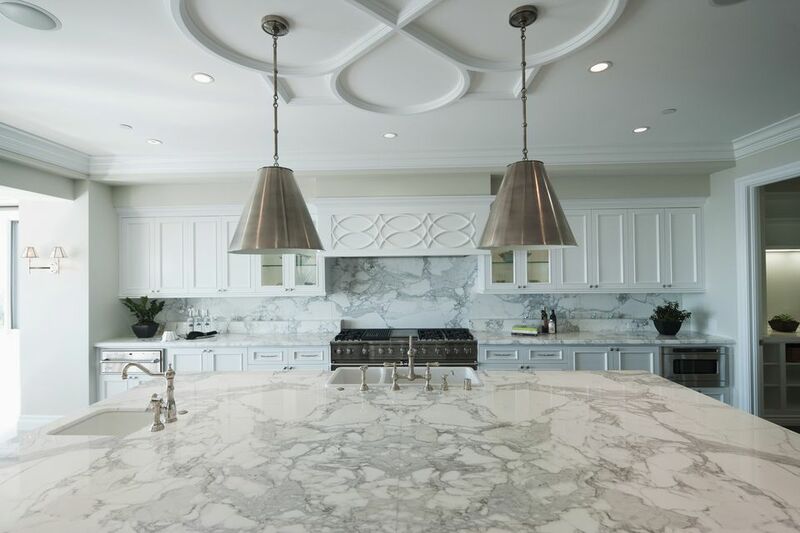 "Quartz" is the catchy marketing term for what is more widely known as engineered stone, itself a term for a slurry of natural minerals combined with resins to create a hard, rock-like surface for countertops. Think of it as less fake than solid surface but more fake than slab granite. Real 100% granite quarried directly from the earth and sliced into slabs. Nothing is added, nothing taken out. Brand Names Corian, Formica Solid Surface, Avonite, Staron, Swanstone, Wilsonart Solid Surfaces. Caesarstone, Cambria, Silestone Slab granite is not associated with brand names, at least on the consumer level. Quick History Developed by Dupont under the Corian brand name as a more solid alternative to the then-popular laminate countertop material. Other companies flooded into the market after Dupont&apos;s patent expired. First developed by Italian company Bretonstone in 1963, the Bretonstone quartz counter technology is now licensed to 52 companies that use the original brevetto, or patent. Slab granite is quarried primarily from India, China and Brazil and shipped to the U.S. for fabrication. Once found only in mansions, slab granite can now be found in homes of all demographics. Trend Meter Cresting in popularity in the 1980s, if only because there were few alternatives, solid surface still enjoys well-deserved popularity as a functional, reasonably priced material. Trendiest of all, quartz has surged ahead and is now installed in more homes than ever. Out of favor. While its name is often invoked to describe kitchen design excesses, slab granite remains a quality, if finicky, counter material. Appearance Uniform, with a matte-like look. Solid surface can be buffed to a glossy sheen but manufacturers do not recommend this as it shows scratches immediately. Lustrous, deep, three-dimensional. Surface can be honed to a gloss, if desired. Homogeneous appearance. Lustrous, rich, and crystalline. Can be honed to a gloss. Attractively chaotic appearance, in sharp contrast to quartz countertop&apos;s homogeneous look. How It Feels To The Touch Matte-like and soft, like touching a bar of soap. Eventually scratches will develop and this contributes to an increased matte-like feeling. Smooth and glossy. Smooth and glossy. Visibility of Seams Least visible seams of all products because seaming caulk is perfectly keyed to the solid surface material. Visible, though a good installer can hide seams well. Same as quartz—visible, though a good installer can hide seams well. Must Be Sealed? No No Yes. Slab granite, being porous, will stain if not regularly sealed. Durability Can scratch and scorch (though scratches can be sanded out). Hard, but can scorch. Hard, but can crack. Will absorb stains if not sealed properly. Cost (Installed) $35 and up. $50 and up. $60 and up. You want a simple, no-nonsense countertop with a homogeneous look and with competitive pricing. You want a solid, stone-like countertop with a homogeneous look that requires virtually zero maintenance. You want a stone countertop that has a one-of-a-kind appearance and you do not mind occasional maintenance duties.